This compact alarm is used to detect high or low level conditions of hopper material. 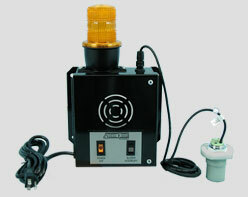 From the 90db buzzer and large bright amber strobe light, to the lighted ON/OFF and Buzzer Interrupt switches, the alarm’s operation is simple. Turn the ON/OFF switch on and it lights up, signaling the alarm is ready. When the sensor detects a problem, the control starts the strobe light and buzzer. The operator can press the Buzzer Interrupt switch to silence the buzzer. The strobe will continue flashing, reminding the operator of a problem. When the condition is corrected, the sensor resets the buzzer and the strobe turns off. The alarm is ready for the next high/low signal.